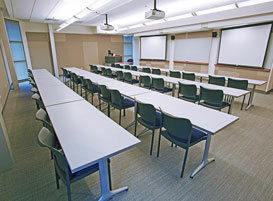 Standard meeting rooms vary in size from about 800 to 1300 square feet and are available in a variety of configurations. The instructor podium includes a computer (connected to the local LCD), cabling to connect your laptop computer, DVD and VHS players and a document camera. Wi-Fi is available anywhere in the building. Natural light is provided by windows near the ceiling but does not distract from your meeting. 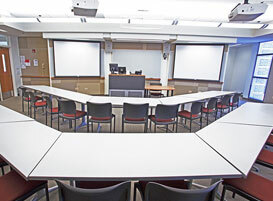 Rooms are available with either whiteboard or blackboard, and flipcharts are available upon request.